Add the login details under the "Users" section. You can add as many accounts as you want. However, you cannot add your own login email or use the same email across multiple dropship providers. Once the login details have been added, your vendors will be able to login to the portal via https://vendors.jetti.io - there is a link on the login form if your vendor ever forgets their password. They can also change their password to something more memorable or secure once they've logged in. Email notifications will automatically be sent out to any users added to the portal if a) you have selected Email / portal under the Syncing orders section and b) the user has shipping notifications turned on. Included on the email order notifications is a one-click login to access the portal and view the purchase order. If you want to preview the dropship portal for any of the users, click on the "login" button. This will log you into the dropship portal as that user. You can also access this button from the main dropship provider list as well. Go to your Setup page and upload a logo. This logo will then appear in the header of the dropship portal (and any packing slips or emails). To set up a custom domain, you'll first need to decide on a subdomain to use (e.g. vendors.yourstore.com). You then need to create a CNAME record for this domain, which points to jetti-vendors.netlify.com. You don't need to buy a new domain, just edit the DNS settings with your domain provider. You should try a Google search to find the instructions for your provider (e.g. here are the instructions for GoDaddy). Get in touch with the support team with the domain you have chosen and we'll set up the rest. Once complete, you'll be able to log into the portal using the new domain. It will also be included on any vendor emails or links within the app. 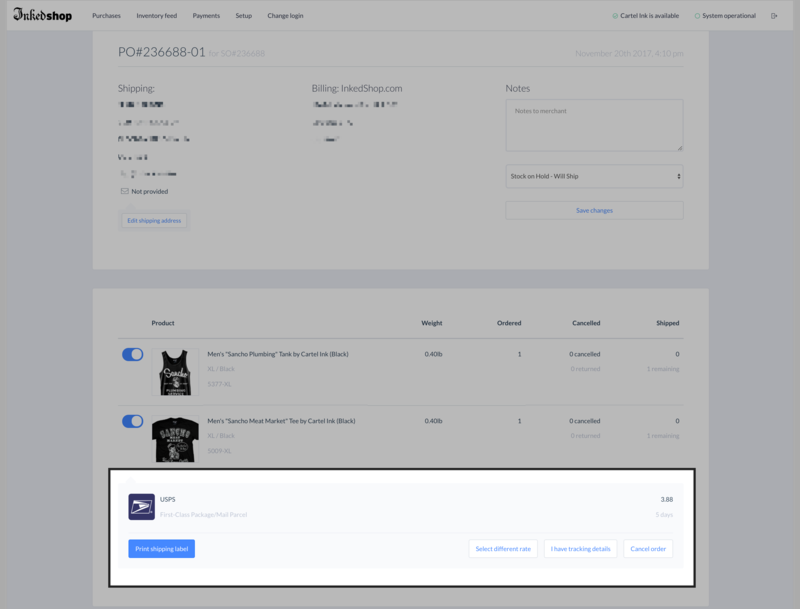 You can use the Jetti dropship portal to automate the onboarding of your vendors, but getting them to complete enter their order, inventory and payments details. To get started, you'll first need to set up a custom domain as described above. First, set any terms and conditions you want to display on the page to the vendor. These can either be displayed inline next to the form, or in a seperate popup. 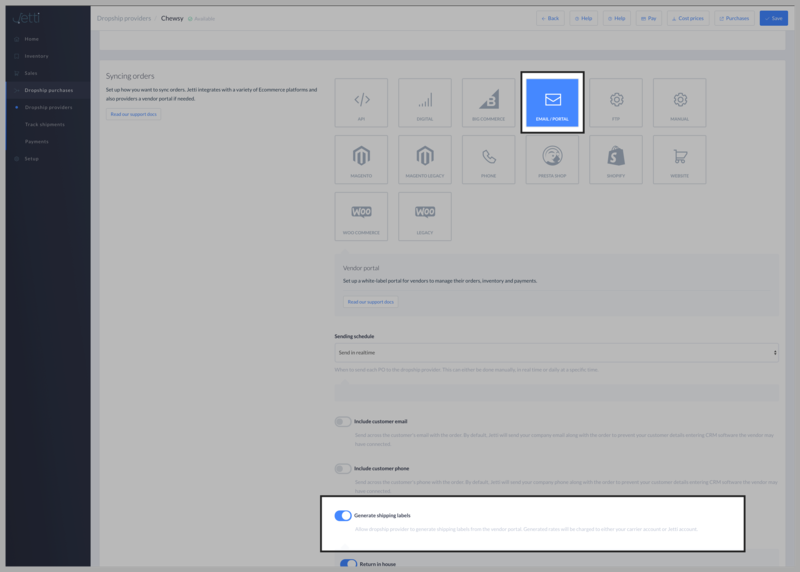 Enter this detail in the dropship provider onboarding section in the Setup area. Set the email address you want to send emails from. This can be changed under the company details section in the Setup area. Once vendors have completed your signup form, they'll be sent an email. You can change the content under the Emails section in the setup area. You might want to a welcome message and some follow up instructions. A button will be included in the email containing a login link. You'll be sent a notification whenever vendors do sign up via the portal. You'll see an alert in the dropship providers list for any vendor you haven't approved yet. With Jetti, vendors can print shipping labels from their dropship portal, using our discounted USPS rates or by integrating your own carrier. If you supply the shipping labels to the vendor, there’s no need to pay vendors to cover shipping costs. This is great for small vendors who can take advantage of discounted rates. Set up your billing details. Shipping labels generated will be billed to your account weekly. For each dropship provider, select Email / dropship portal, then Generate shipping labels.